This book has been published to commemorate the fortieth anniversary of the foundation of the Organ Historical Trust of Australia in 1977. 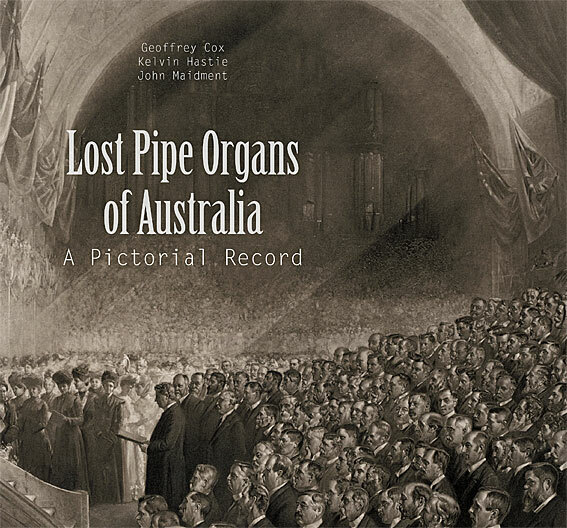 It provides a pictorial record of pipe organs in Australia that have been lost through various agencies. Some have simply been removed and broken up, others have been destroyed by fire, and others have been rebuilt beyond visual or tonal recognition. 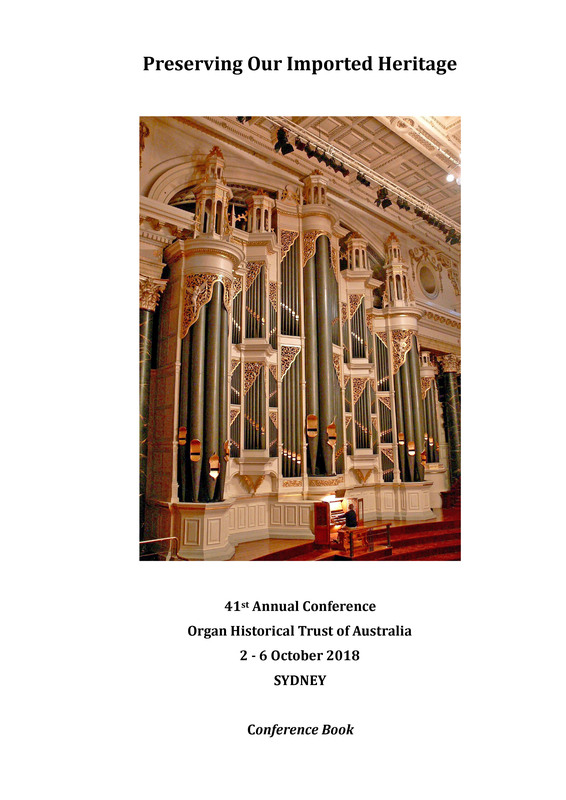 Australia’s heritage of pipe organs stretches from the early nineteenth century to the present day, reflecting the cultural context in which the organ has existed. The cover illustration shows Tom Roberts’ well known painting of the opening of the first Parliament of the Commonwealth of Australia in 1901. In the background can be discerned the pipe organ built by George Fincham for the 1880 Melbourne International Exhibition, effectively ‘presiding’ over the event like a spectre. 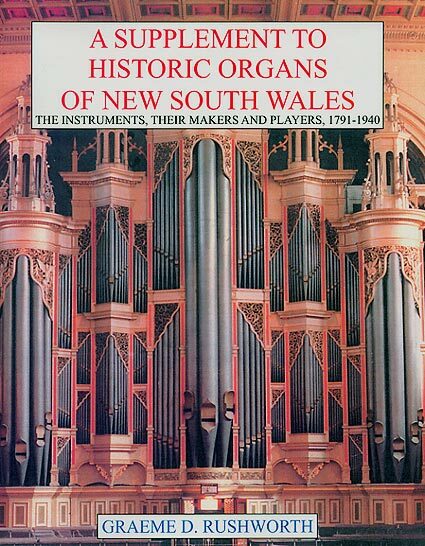 A Supplement to Historic Organs of New South Wales – the instruments, their makers and players, 1791-1940 is now available, published and distributed by the Organ Historical Trust of Australia. 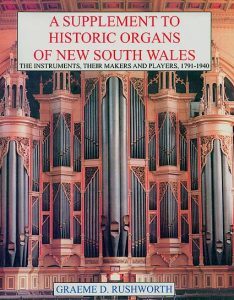 If you liked Graeme Rushworth’s 1988 work Historic Organs of New South Wales, you must have the Supplement! If you do not have Rushworth’s 1988 work, do not despair! The Supplement is a stand-alone work packed with fascinating reading, and is the same ‘Mixture IV’ about people, organ and church history, and music. The Supplement has been designed as a companion volume to present new information found since the 1988 book was published. 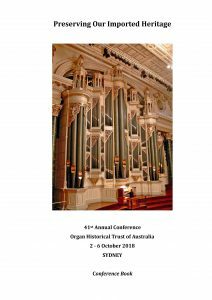 More about the early organs in NSW to 1855 including the 1840 Bevington for St Mary’s Cathedral, and also a full account of Francis Ellard and his musical family and the organ they brought to Sydney in 1838. NSW, interstate and overseas builders and their work in NSW – additional notes on Johnson, Kinloch, Jackson, Davidson, Layton Bros, Broderick, Smith, Aeolian Company, Balbiani, Norman & Beard Ltd, Pilcher, Positive Organ Co, etc. Descriptions of the Bates & Son organ at St John’s, Camden, with the operating instructions for its “dumb organist” barrel attachment; the great auction of Flight & Robson’s stock in 1832; the fires at premises of Bevington, Hill, and Walker. More biographies of important NSW organists including Alex Rea, Alice Bryant, the Gehde and Mote families, Frederick Morley, Charles Tuckwell and others. Biographies of renowned overseas organists Renée Nizan and W.H. Jude and their concerts in Australia, and details of Marcel Dupré’s Sydney visit and concerts. A “Miscellaneous” section includes descriptions of the University of Sydney Musical Festival of 1859; several large orchestrions in Sydney; the two Bishop families of organbuilders in NSW; organ histories of NSW churches that were previously unknown; Thomas C. Christmas and his work in Queensland, etc. An appendix of information on 120 British organbuilders and their families, compiled from the 1881 British census. 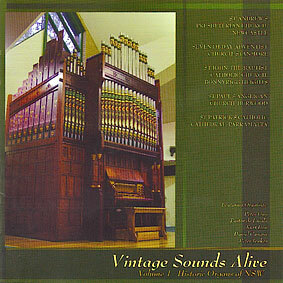 The choice of music in the first commercial recording of the 1877 Hill & Son concert organ at Tanunda has been influenced by works performed on the organ when it was placed in Adelaide Town Hall and played upon by distinguished local and overseas performers up to the visit of Marcel Dupré in July 1939. The organ was opened in October 1877 by Melbourne City Organist David Lee, a series was given in 1892 and 1896 by August Wiegand, Sydney City Organist, while in September 1903, Edward Lemare was a distinguished visitor, and played an amazing selection of repertoire. The instrument was well displayed during Marcel Dupré’s 1939 visit in a wide-ranging selection of works. 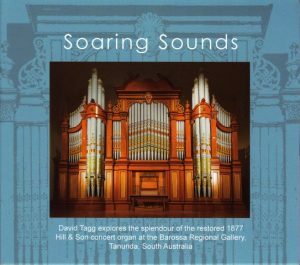 The performer David Tagg is one of Australia’s most gifted younger organists. His initial studies were at Knox Grammar School in Sydney with Peter Kneeshaw, and he has subsequently been organ scholar at St Stephen’s Uniting Church, Macquarie Street, Sydney and Christ Church St Laurence Anglican Church, Sydney. He has given recitals in the two Cathedrals in Sydney and Sydney Town Hall and accompanied the choir of Christ Church St Laurence in its overseas tour 2014-15, performing in London, St Albans, Brussels and Paris. He specializes in performing romantic music from England and France from the mid-19th century to the start of the second world war. He completed his postgraduate studies in architecture at the University of Technology Sydney in 2015 and now works within the architecture field. The recording has been made by Thomas Grubb, of Mano Musica, Melbourne. The striking CD jacket includes an eight-page booklet. The CD may be obtained from the Friends of the Hill & Son Grand organ. 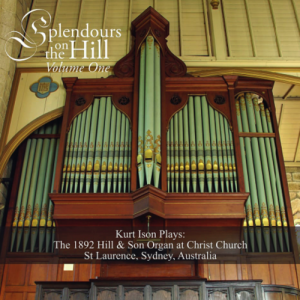 This exciting new disc gives fresh voice to one of Sydney’s best preserved historic organs, with a very wide variety of pieces that showcase the instrument’s dual personalities as both a Liturgical and concert organ. Kurt Ison is the Convener of the Christ Church St Laurence Sydney’s successful monthly organ recital series that was launched in 2009. He is also one of Australia’s leading organists, having played solo concerts in prestigious venues such as St Paul’s Cathedral London, Notre Dame Cathedral Paris, Washington National Cathedral and Westminster Abbey. This CD production was assisted by the OHTA through a grant from the “Christopher Dearnley Award”. The CD may be obtained digitally as well as the traditional format (order using supplied form). 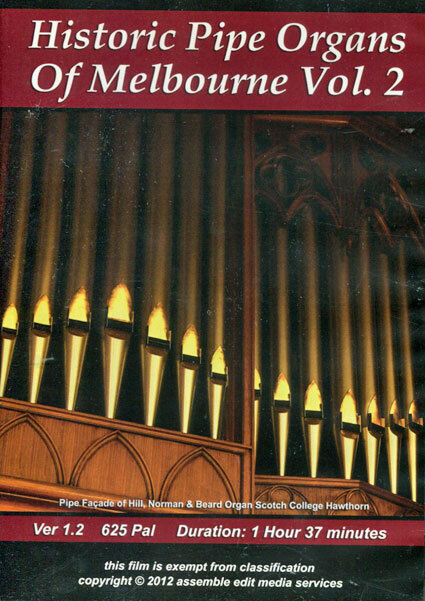 OHTA has produced a recording of five historic organs located in New South Wales. The aim is to showcase instruments which have been restored in recent years by Mark Fisher of Pipe Organ Reconstructions or Peter D G Jewkes. Two of them, Bonnyrigg and Parramatta, are very successful ‘transplants’. The players are Daniel Canaris, Pastor de Lasala, Peter Guy, Kurt Ison, and Peter Jewkes. They have selected music which demonstrates the tonal resources of each instrument, ranging from 18th c pieces for manuals only to Handel, S S Wesley, Mendelssohn, Hollins, Thalben-Ball, Whitlock, and William Mathias. The sound has been vividly captured by Greg Ghavalas, and comprehensive notes by Dr Kelvin Hastie OAM on the instruments have been included in the accompanying booklet. 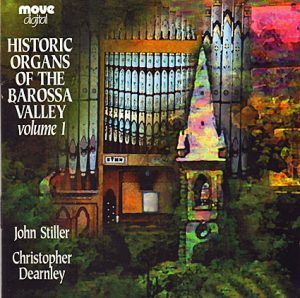 Performances by Christopher Dearnley and John Stiller on six of the historic church organs of the Barossa Valley. 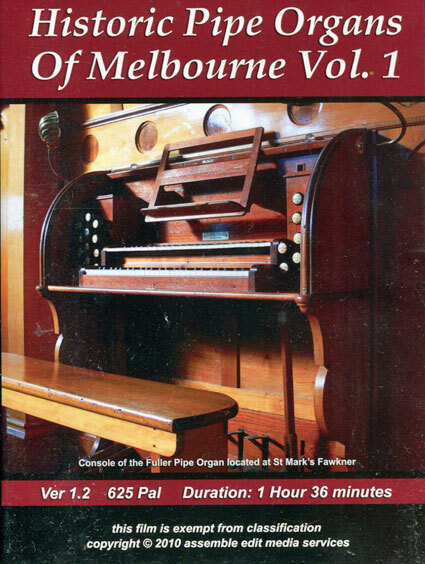 Includes a 16-page booklet giving a history of the organs in the Barossa area, their builders and the music. 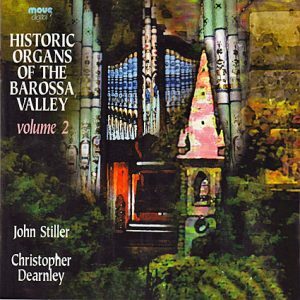 Performances by Christopher Dearnley and John Stiller on seven more of the historic church organs of the Barossa Valley. Performances by Rhys Arvidson, Michael Heighway, Rebecca McLennan, Andrew Mariotti, Christopher Trikilis. Introduced by John Sheridan and featuring extensive interviews with John Maidment, this DVD contains an hour of music played on the following historic pipe organs. Running Time 1 hour 36 minutes. This DVD is in PAL format and requires a multistandard DVD* player & TV to play in the USA. Alternatively, it will play in any late model PC fitted with a DVD drive. Performances by Rhys Arvidson, Christopher Cook, Andrew Mariotti, Dom Alban (Philip) Nunn OSB, Ben Sheen and Christopher Trikilis. Introduced by John Sheridan and featuring extensive interviews with John Maidment, this DVD contains an hour of music played on the following historic pipe organs. Running Time 1 hour 37 minutes. This DVD is in PAL format and requires a multistandard DVD* player & TV to play in the USA. Alternatively, it will play in any late model PC fitted with a DVD drive. Copies of the 88 page 2018 conference book are available from PO Box 200 Camberwell Victoria 3124 at a cost of $25.00 inclusive of postage and packing in Australia – overseas rates upon application. Payment by credit card or by cheque made payable to Organ Historical Trust of Australia. The book is illustrated in colour, with historical and technical information on all of the organs visited. Please email Hugh Knight for more details. Copies of the 87 page 2017 conference book are available from PO Box 200 Camberwell Victoria 3124 at a cost of $20.00 inclusive of postage and packing in Australia – overseas rates upon application. Payment by credit card or by cheque made payable to Organ Historical Trust of Australia. The book is illustrated in colour, with historical and technical information on all of the organs visited. Please email John Maidment for more details. If you would like to make contact with OHTA, please forward your enquiry to the closest council member representative in your state. 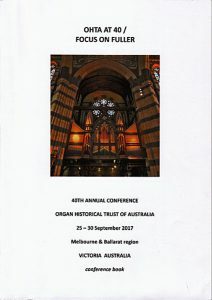 Discuss the historic organs of Australia amongst our Facebook community of 350+ members. OHTA cannot exist without the support of a viable membership base. We encourage all those who value our organ heritage to join OHTA and be automatically subscribed to OHTA News, a quarterly publication on the organs of Australia.